This date is not going well. I want to die all over again. (MILD SPOILERS) The idea of a zombie love story sounded so desperate and wrong (as in, a really dumb premise designed as a cash-in), I didn’t give it the time of day until now. Even with the generally positive reviews, it failed to really sway me. So when I say it is a pleasant surprise, it’s not due to lowered expectations but rather because the unlikely angle works really well; Romeo and Juliet by way of Edward Scissorhands with a ready wit (difficult to do when Shaun of the Dead seems like the last word on zomcoms), an affecting romance and a surprisingly original mythology. Nicholas Hoult (who hitherto – see Jack the Giant Slayer – has come across as one of those nondescript actors being pressganged into slightly awkward leading man status) is R, a reluctant zombie with a vigorous sentience but who can’t even remember his full name. His external manner is belied by an active interior monologue, impressed upon us through soundtrack narration. Sure, he has an overpowering need to feed on brains but he doesn’t really want to. He’s able to communicate, of a sort, with “best friend” M (Rob Corddry), described as an interaction in which they “occasionally grunt and stare awkwardly at each other”. The zombies aren’t exactly a community, but their relative humanity is emphasised by the existence of “Boneys” further devolved zombies that have lost any last vestiges of a living state. When R and his colleagues attack a party of humans, he kills one (Perry, played by Dave the-brother-of-the-ubiquitous-James Franco) but is seized by the impulse to rescue Julie (Teresa Palmer). Something has awakened within him, even before he feeds on Dave’s grey matter, and slowly a romance develops between mismatched pair. In another considered twist on lore (I admit, I’m not well-versed, but this isn’t something I’ve seen before) the feeding on brains gives zombies a rush of memories and “humanity”; it’s like a drug. Yet, when his evolution is triggered, he is impelled to spit out his snack store of Dave brains. Before long, the only slightly inarticulate R is fully conversant. Further, his heart begins to beat again, triggering a similar rekindling in the undead around him. It sounds pretty corny, and it’s easy to imagine that in another’s hands director Jonathan Levine’s screenplay (I haven’t seen his other pictures, but this one is based on Isaac Marion’s novel of the same name) might have been quite awful. You know, Twilight awful. But Warm Bodies is self-aware and inventive, even as it ensures it follows a recognisable path; it’s a forbidden love that R and Julie share. After all, John Malkovich is Julie’s dad. As leader of the remaining humans he hates zombies, naturally, so the last thing he wants is a drooling prospective son-in-law. The soundtrack is replete with a readily assembled compilation of tunes denoting romantic uplift (M83 is there – surprise – and Bruce Springsteen’s Hungry Heart is one-the-nose but amusing for it). Because Levine keeps things witty the elements that are ripe for showing ripeness fly. If the metaphors are undisguised in terms of the awkwardness of attraction and expression, for every “It must be hard being stuck in there” we get an amusing “Don’t be creepy. Don’t be creepy. Don’t be creepy” as R attempts to act cool with the girl or a self-deprecating “I have zombie fingers” (and terrible posture). There’s the occasional stumble. The Boneys are never less than cheap CGI, so it’s a wonder Levine’s able to eke any tension from them. And he arguably relies a little too much on zombie foreknowledge as, aside from a tasteful attack on Julie’s group we aren’t shown the extent of their gore-strewn plundering. It’s also a little shocking how easily R breaks into the human compound. If this was The Walking Dead, the living wouldn’t last five minutes. Hoult and Palmer make winning leads; I don’t know if this one is classified as part of the Young Adult genre but, if so, it’s streets ahead of the competition. One might moan that no one here is really made to look like a gross cadaver; more as if they’re partial to dodgy Goth music at worst, with a few tasteful scars. As such, there isn’t any at Beauty and the Beast or Hunchback of Notre Dame resonance. Would Julie still love R if his limbs were dropping off left right and centre? Admittedly, that really isn’t the point. 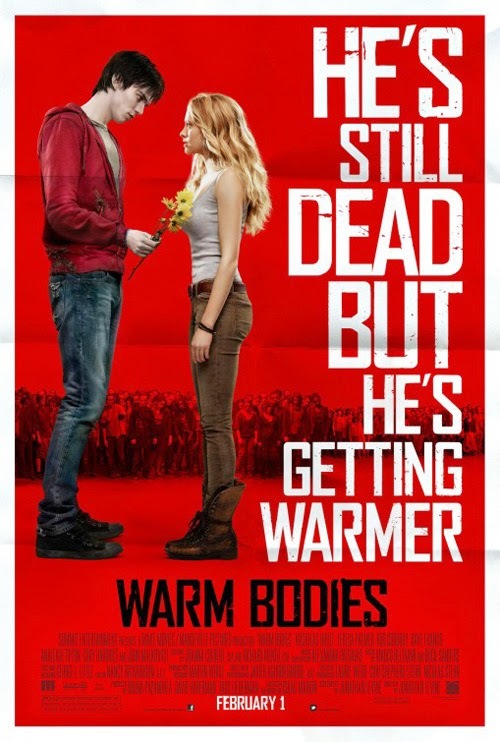 This is an unabashed proclamation of the power of love, rather than an endurance test; that Warm Bodies manages to get its message across without devolving into overt sentiment or banal platitudes is achievement enough. And marvellously, despite its box office success, it’s rather precluded from a sequel… Except that Marion is already writing one.